The PDF Non Stop MTB Ultramarathon reaches its 14th edition in 2019 and will be again the MTB Ultramarathon European Championships! It is a rally on MTB of about 213 kilometers and with 6,200 meters of accumulated positive climb with departure and arrival in Vielha, Val d’Aran (Lleida, Catalonia, Spain). 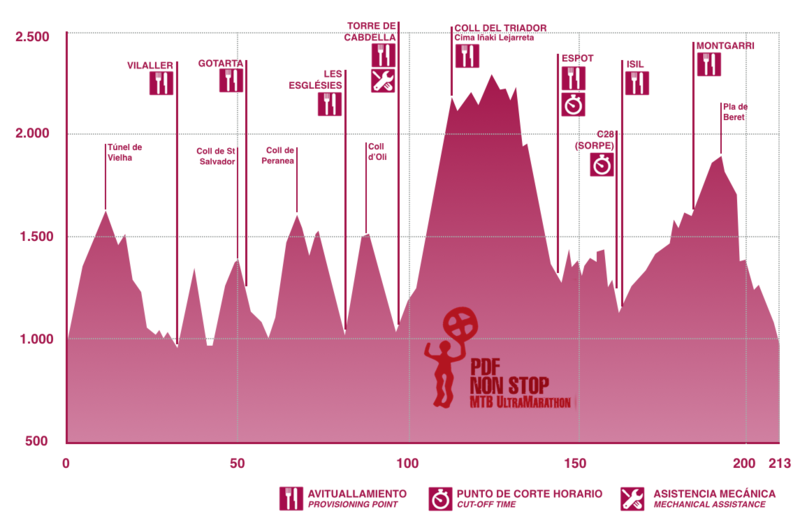 The route follows the itinerary of the mythical Pedals de Foc for the most part. It passes through the regions of Valle de Aran, Alta Ribagorza, Pallars Jussà and Pallars Sobirà, in the Pyrenees of Lleida. The last years has been the Spanish Championship of the specialty, and in 2017 the first European of the discipline. In the 2018 edition, 1,000 entries will be offered. Towns: Vielha, Senet, Vinyal, Ginast, Vilaller, Llesp, Iran, Irgo, Gotarta, Raons, Malpás, Castellars, Erta, Sas, Sentís, Les Esglèsies, Guiró, Astell, La Torre de Capdella, Espui, Espot, Son, Sorpe, Borén, Isil, Alòs d’Isil, Montgarri, Bagergue, Unha, Gessa, Artíes, Garòs, Casarilh, Betrén, Vielha. If you want to join the Pedals of Foc Non Stop it is necessary that you read carefully the regulations of the race. Once you have made the registration, we understand that you accept it. You need a good fitness to cover the route succesfully. Also be advised to carry proper equipment (mountain biking and basic tools). During the race there will be some checkpoints and feed stations for the optimal development of the event.